Vixen was a tan and white female Smooth Fox Terrier, owned and loved by Betty Gardner. She was my FIRST Competition Flyball dog. I started training Vixen when she was about 9 months old. She was a “natural” retriever and simply LOVED tennis balls! We started competing in 1996 at NSL’s first flyball tournament. She wasn’t very fast, running mostly in the 6 and 7 second range, but she was a very reliable height dog. We could ALWAYS depend on her to complete her run no matter what! 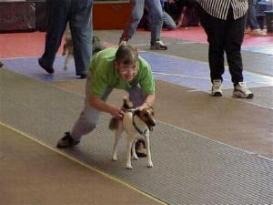 Vixen also competed in Agility and Obedience. 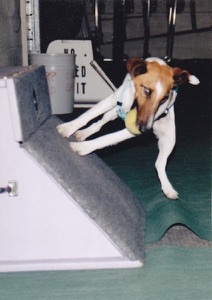 Although Vixen passed away many years ago, she is still the 14th highest pointed Smooth Fox Terrier who ever competed in flyball. Vixen’s titles include AD, OA, NAJ, EAC, OGC, OJC & FDCH.